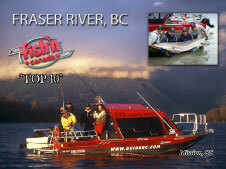 Fraser River Makes Top Ten Canadian Fishing Destinations! For the past 30 years the Fish'n Canada Show crew has travelled North America fishing some of the most productive waters looking for that trip of a lifetime. 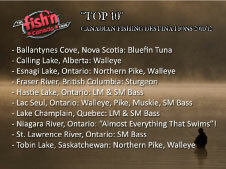 The Fish'n Canada Show just released their TOP 10 Canadian Fishing Destinations and Fraser River places number 4 for its amazing Sturgeon Fishery. Mission's very own STS Guiding Service has been hosting the Fish'n Canada Show for the past 5 seasons, Angelo Viola & Pete Bowman have both filmed episodes in Mission where they have caught some incredible sturgeon. "I can't believe we made the top 10 , these guys have fished every corner of the country and to choose our very own back yard as a Top Canadian Fishing Destination is a real honour", says Vic Carrao, owner of STS. "This is not only great for Fraser sturgeon but more importantly, Mission Tourism." Anglers from around the world converge on the Fraser each year to fish for trophy sturgeon. Mission is by far the most productive area of the Fraser to fish and offers visitors great waterfront access and small home town atmosphere. According to Vic, Sturgeon fishing has never been better on the Fraser and will only improve. Current regulations focusing on catch & release and conservation will help ensure a fishery for the future. For more information on Fraser River sturgeon fishing, please visit STS Guiding Service.